My iMac is old enough I can't update the operating system anymore. It doesn't have the capabilities/memory to upgrade to Snow Leopard, Maverick, or Yosemite. No ad blockers for me, sigh. Webpages keep telling me I need to update my browser, but they don't understand I can't. Your iMac is older than mid-2007? This Summer I upgraded my mom's iMac from Snow Leopard to Yosemite. It needed a memory upgrade first but that was something like $20 (memory is very easy to upgrade on the older iMacs). Thanks for the post. Ad Blocker seems to work. Should have known about it and used it long ago. 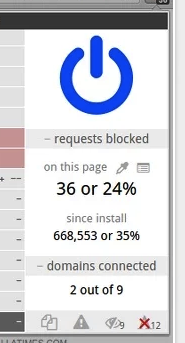 Adblock has bee around for a while but its almost a continuous battle between the blockers and the advertisers. But desktop browsers are seen as a minor percentage of all web traffic. Many sites see mobile browsers are leading. That was the best explanation I've read about ad blockers. I am reluctant to use them because I like free internet, and now that you've explained how they work and their purpose I am ready to live with them. Not possibly the correct reaction but there is a tiny capitalist in me struggling to get out. Many of the tech sites are sort of torn between reporting the benefits and the fact that they rely on the ad revenue to provide free content. I'm in the group who doesn't care about seeing ads but object to the tracking cookies that some use. They always have the option of hosing their own ads (first person content) but that would be a major revision of their business model.